Need more information about booking Home 108257 ? This property is one of the GLORIOUS GLASTONBURY HOLIDAY HOMES group of rentals in central Glastonbury. We have two cottages ad two apartments at a price to suit all budgets and all within the town centre environs. ORIEL DRIVE OFFERS COMFORTABLE, QUALITY ACCOMMODATION AT A BUDGET PRICE - IN THE HEART OF GLASTONBURY. High speed internet. Fabulous view of The Tor. 15 Oriel Drive is a neat, comfortable two bedroom home in an ideal location at a price that won't break the bank. The apartment sleeps three people in one double bedroom and one single or a third person could use the sofa bed. Oriel Drive is a few minutes level walk from the High Street and is just a couple of minutes to the entrance door of the supermarket which is opposite. If you're like us and love the majesty of The Tor then you will revel in the stunning view of it from our living room - check out the photographs. We also have another three properties - beautiful, town centre rentals with private parking and gardens so if Oriel Drive is already booked at the time of your visit, perhaps one our other apartments or cottages will suit you so please do get in touch. The accommodation comprises a double bedroom, single bedroom, living room with double sofa bed, kitchen and bathroom. If three single people wished not to share a room, the sofa bed in the living room means that everyone can sleep in privacy. It's not a large flat, (small but perfectly formed) but it's the ideal self catering holiday for couples or 3 people. - It is situated on the second floor so it probably wouldn't be suitable for anyone with mobility problems. There is a flight of 13 steps to the first floor, then two half flights of seven steps so twenty seven steps in total. There is private parking at the rear of the building. Everything is arranged for your convenience and comfort and fittings include, washing machine, tumble dryer, microwave, freeview TV, DVD player with a good library of DVDs. If you are familiar with our holiday cottages 'Woodward Mews' and 'Avalon Cottage' then you will know that we offer out of the ordinary holiday accommodation with lots of personal touches seldom seen in rental property. 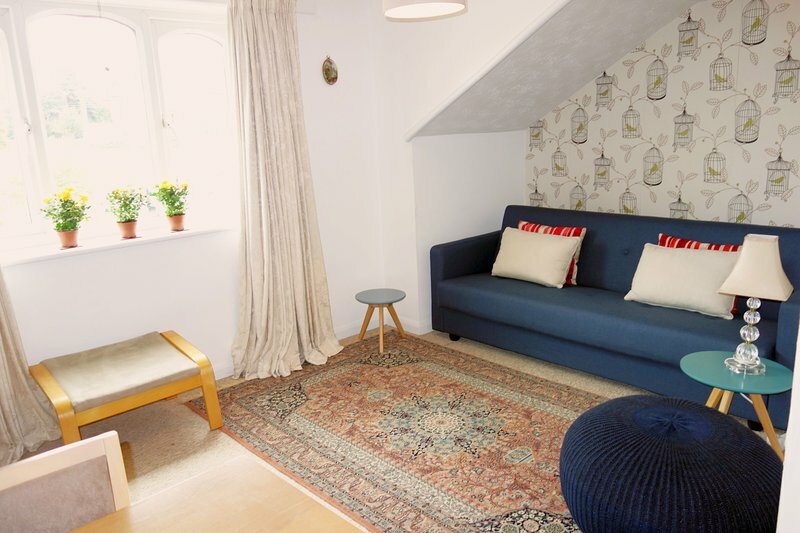 Our flat has some of the style and charm of the cottages but on a smaller scale and at a much lower price. If you're not driving then don't worry, the sacred sites, the shops, pubs restaurants and cafes are all within walking distance. Bath and Bristol - take the bus. Tintagel, Stonehenge, take one of the local tours or speak to a taxi driver. The amazing City Of Wells - don't miss it, it's beautiful - take the bus. I am only a phone call away. We ask you to not wear shoes indoors as the whole apartment is fitted with pale coloured carpet. The apartment is not suitable for small children, it's too easy to climb onto a window ledge and it's a long way down. This Apartment has 2 bedrooms, 1 bathroom and sleeps 3. It’s been listed on Holiday Lettings since 18 May 2010. Located in Somerset, it has 57 reviews with an overall rating of 5. The average weekly rate varies from £401 to £596. Lovely Flat. Ideally located and very homely. Couldn't have asked for a better place to stay :-) Would definitely stop here again and have recommended it to my cousin for her holiday. Everything was just as it should be. We had an excellent holiday. We wondered if Morrison's being so close would be a problem but it wasn't. It wasn't open too early or too late and it was interesting to have something happening all the time if we cared to look. The view over the Tor was amazing and you have the light and weather changing making it different every time you look. If we got up in the night, on a clear night, there was a single bright star above the Tor. A bonus for us was that the cats were friendlier than at home, and were mostly happy to be stroked. I loved the smells of incense and spices from the shops and the general ambiance of a place lost in time. Owner's reply: Immediately we spoke with this guest, we put an extra, lower level mirror and a new ceiling light in the bathroom, both fair comments. The beds are a UK standard 4'6" double and a 3' single, we also have a good sized double sofa bed. Cheap, cheerful, comfortable, and a short walk from everywhere. We’ll be back. Cosy, comfy and well equipped, we immediately felt at home. The shops and attractions are only a few minutes walk away. Although the flat overlooks a supermarket it felt more like a plus than a minus, as it proved very useful for food shopping and cooked breakfasts! Lovely view of the Tor from the lounge window. We can recommend this flat, which represents very good value for money, and I'm sure we will stay again now we have found it! My family and I ( Two adults and one Teenager) spend 5 days there and we all feel sorry when it was time to leave. The appartment is very cosy and clean, is very close to all attractions and the supermarket and you have the ultimative outlook at the Tor. The kitchen has everything you might need and even when the wearher isn't so good that great DVD Collection will help you through the day. Oriel Drive offers a clean, comfortable, and cosy base from which to explore the spiritual and theraputic place that is Glastonbury. It is conveniently situated for the town centre and has a wonderful and compelling view of the Tor. Because the appartment is on a higher level the supermarket, which is close by, is not intrusive and we found our stay to be suprisingly peaceful. This beautiful little flat easily felt like home, the kitchen has everything you need. The beds are very comfortable. There's a large supermarket nearby, where you can find everything you need. And every morning we had a different view of the Tor, with clouds or in the mist, and seeing the Sun coming up, was also unforgettable. I would love to stay in this cosy flat when I return to Glastonbury. I enjoyed our stay in this appartment very much and I hope I will be able to visit again real soon. The location is great, all of Glastonbury main atractions are nearby. It has a great view of the tor!